April = Earth Month: how better to celebrate recycling & revisioning than STEAMPUNK?? 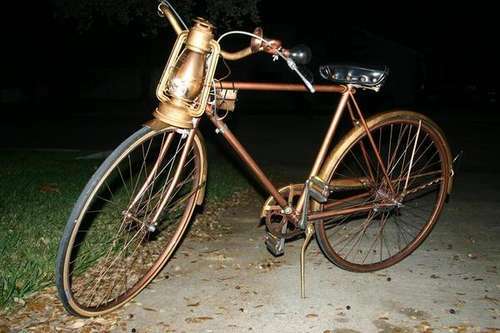 Yes this Earth Month April, in recognition of the 40th Anniversary of Earth Day, I’m going green in a STEAMPUNK way! 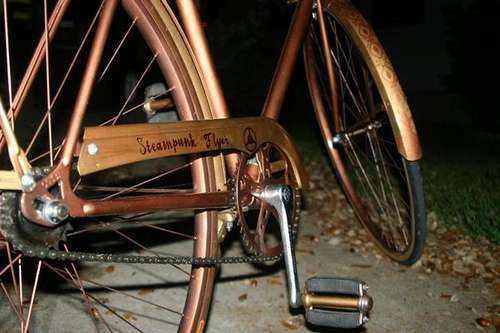 Show off your STEAMPUNK! Beer from Anacapa!! What’s STEAMPUNK? Recycled Fashions! Wild Inventions! Recreate! ReUse! ReDesign! Bring a cup & money to donate for beer & food!! Watch for more information: here at Art Predator and at bikergogal on how to participate in the ride and fashion show and more details on what in the world we mean by Steampunk anyway! ← Social Media Poetry: Meet The New Dork — Same as the Old Dork? In 1970, when the first Earth Day event was held, the amount of clothes and shoes discarded in landfills topped 1.6 million tons in the US. By 2010 the amount of clothing discarded has increased five-fold to more than 8 million tons. As the Earth Day movement turns 40 years old in 2010, the strain on our planet’s resources and ecosystems is still increasing, and the need for action to protect Earth, our home in the universe, has never been greater. My name is Butch Davenport. I work for a company that recycles textiles with the primary mission to keep usable clothes out of landfills. We reuse and resell clothing to affordably dress people both locally and around the world. We provide green sector jobs to Americans in a sustainable growth industry while providing affordable clothing to people locally and around the globe. 80% of the world’s population survives on less than $10 a day. For many secondhand clothing is all that is affordable. A pair of pants in clean, damage-free condition can be delivered to the east coast of Africa for only $0.34 a pair – and a sweater to Pakistan for only $0.12 each. This is less than the cost to mail a letter. When we collect surplus clothes and shoes in the US and ship them around the world we are in fact redistributing resources to where they are most needed. My company U’SAgain (pronounced use-again) is planning to celebrate Earth day/Month by diverting over 5 Million pounds of clothes and shoes from landfills during the month of April. In an effort to conserve resources, fight climate change, and reduce solid waste in landfills, U’SAgain collects and reuses clothing. Together we can save our planet. If you have usable used clothing and want to help us reach our 5 Million Pound Earth Day/Month goal you can go to our web site at http://www.usagain.com or e-mail me at b.davenport@usagain.com and I can direct you to the closest collection box.